n the city of Campana, where «the soft water was fresher than the river», my friend interviewed today was born. There’s a gate through which memories go back home and through that open door represented by Juan Carlos’s heart I step into his life, asking him to tell me things. Those things that are said when you are drinking mate in the shade of an old plantation and which we guess may appeal to the public who are the indisputable addressees of our songs. «Tango began to be something that interested me by 1933 when Agustín Magaldi came to Campana. He had to appear one Sunday at the theater of the Sociedad Italiana, but he had temporarily lost his voice and was unable to sing. He then only talked to the audience and his five guitarists played instead. I was a kid but I recall that Magaldi was a good-looking man and the fact that he was there was enough to please the audience. «By that time Carlos Gardel appeared at the Teatro Moderno and I remember quite clearly that I bought cigarettes for a woman that was coming with him and so I managed to be admitted for free. At that time I was wearing short trousers and I recall that Gardel sang seated, placing the guitarists behind him. «When I was 13 we had a rendezvous with the boys to have a good time singing. Among them was Antonión who did it quite well. He had a treble voice. Sometimes we teamed up as a duo that was much acclaimed. So I started to be in touch with tango. «When I was still a kid I used to work at a farm and at the time of the corn harvest there were many people hired who worked, ate and slept there. In the evening everybody sang and I also sang folk songs and so I was caught by the enthusiasm for singing. «In 1936 my family came to Buenos Aires and I went with them. We lived in the neighborhood of La Boca and soon I began to work in the workshops of the Ministry of Public Works and there, my foreman greatly encouraged me to sing. He used to tell me: «Get ready the boiled mate and sing. If you don’t sing I don’t want you here with me». «One day my fellow workers raised some money so that I would cut a record. We were a united group that used to gamble and bet on horses. For that reason my wage was not enough because when I was paid I had to pay my debts and no money was left. I used to gamble by borrowing. This vicious situation led me to quit my job in the ministry. «In 1949 I began to work at the Banco Municipal and there I also sang at the meetings. The bank was more widely known with the name of “Banco de Empeño” (pawnshop) and when someone came to pawn a guitar, the one in charge of valuing the articles used to ask my advice. Sometimes some with an ebony fingerboard made by Casa Núñez were brought. True gems, but then I had not learned to play guitar and today that I’m old I’m studying for fun. I remember that once I had to sing at the Agusteo and then I performed “Allá en el bajo”, a tango that still today I keep on singing. «I was already married and was ready to quit singing to devote myself to a serious job when I was invited to a meal. At the end of it I was invited to sing. Fortunately Vicente Salerno was there. He was lead violin of the Ricardo Tanturi’s orchestra and told me that the bandleader was auditioning singers to sing along with Elsa Rivas and Horacio Roca and he added: «Maybe the vocalist he’s looking for is you but Tanturi has to hear you. So let’s go on Monday to Radio El Mundo at 9 pm». «There we went and that day I was at the audition. I chose a tango that Rufino used to sing, “Griseta”, and don Ricardo, after he heard me, said that I was chosen for the orchestra, but due to compromises he had with other people he had to go on auditioning singers recommended by the radio station. We went to have lunch and he told me that I had to bear the name Juan Carlos Godoy, «Because Llanos has no stress», he told me. I didn’t like the name but had he told my name had to be Juan Pérez I would have agreed as well. «I began with Tanturi in 1956 while I was still working in the bank. When we had shows at cabarets we finished late and I arrived at the bank half asleep. I traveled with a pillow stuck to me. I appeared at the Marabú, the cathedral of tango. “La garçonniere” was the first number I sang with the orchestra and “Decís que no te quiero”, my first recording. On the other side of the disc Elsa Rivas recorded “Besos brujos”. It was a two-year tenure and thereafter I switched to the Alfredo De Angelis Orchestra. «Carlos Dante was about to quit and Marvil talked to me at the cabaret’s exit: «Is there a possibility for you to join De Angelis». How can that be? I asked surprised and he answered me he was told to ask me about that. Then he invited me to go to don Alfredo’s place in Banfield. OK, I replied. «On a Thursday at 9 in the evening we went to the maestro’s home where Oscar Larroca was as well. He auditioned me accompanying me on the piano. I chose the tango “Yo no sé llorar”. Later I recorded it as a duo with Larroca. The orchestra leader was satisfied but before accepting I wanted to talk to Carlos Dante. «I asked Dante if he was bothered about the situation and in that case I would not accept it. His answer was sharp: “If you were summoned, don’t worry because I’m going to sing as a soloist”. Then I accepted. «The first tango that I sang and recorded with my new orchestra was “No culpes al amor” written by Juan Pueblito and Roberto Caló. Later there was a change of singing partner. Larroca quit and Roberto Florio (Chocho) came but as we had the same vocal range it was impossible for us to sing as a duo. When Lalo Martel came we returned to the duos and, when the kid Mancini appeared it was even better because he played guitar well, knew music and we achieved many hits with our discs, here and in Colombia. It was a nice successful time that I did not know how to take advantage of financially because I, from time to time, used to return to Argentina to sing here as soloist. «I cut a compact disc along with Mariano Mores, Leopoldo Federico, Alberto Podestá and other friends and in 2004 I recorded “La mariposa” and “Alma en pena”. 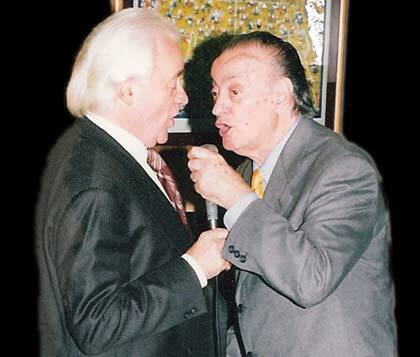 «I recall that at the Rincón de los Artistas, Ángel Díaz handed me a tango piece he had written with his brother, “Se tiran conmigo”. I used to sing it as a novelty and people liked it very much. About that time Alfredo Belusi came to the venue and he liked the number very much too and he was interested that José Basso would hear it. After several unexpected events and in spite of my firm resolution of not singing again with an orchestra they persuaded me and I recorded seven tunes with Pepe. Just a few pieces because tango records were no longer easily sold as before. We recorded in the Columbia studios reinforced by Enrique Francini and Antonio Agri on violins. I cut “Melenita de oro” and in the middle of the tango, when the counter melody by the violins entered and I was singing a “second” vocal part, it seemed that I was singing in Heaven. It was extraordinary! «When Francini listened to the long-playing record was enthusiastic, «Because with De Angelis you sang in one way and here, differently», he told me. «With the Sexteto Mayor I cut two long-playing discs in Colombia but, due to contractual reasons with Odeon, those records were released as Luis Stazo’s Sextet. «I traveled extensively, but where I remained a long time was Colombia. Those were times when you had to go abroad to make a living and so I appeared in New York, Miami, Chicago, New Jersey, Denver and Boston, besides Chile and Ecuador. «With Troilo I had a nice story. El Gordo (Fats) was so kind and tender. One day in 1964, during the radio show Patio de Tango with De Angelis, he told me: «Kid, will you do me a favor? I sent Goyeneche and Rufino to have some sleep so that they would rest and so they won’t be at the rehearsal. Can’t you sing a tango so we’ll be able to practice?» and I agreed. I sang “El motivo” and Luis Stazo, by that time the lead bandoneon with Alfredo, told me: «Juanca, Troilo is auditioning you» and then I replied that I didn’t know if he was auditioning me but I could not miss my trip to Colombia with De Angelis because there was a good pay, around 5.000 dollars. Lastly, I have in my hands the last release of my friend Godoy. An independent production, Flor de yunta, along with our peer Reynaldo Martín. In it Juan Carlos, over 80 years old, revalidates his well deserved fame of exceptional singer.